Tavern Kafana Kod Juge is located at Danube quay and represents a place for night life that Belgrade was seeking for. It's about tavern that will leave its mark on night life and it will consolidate your bohemian visions. As founders say, tavern Kafana Kod Juge will bring back glory to night life in Belgrade and remind you that bohemian lifestyle is about to come. So prepare yourself for serous parties in taverns that last all night long. In tavern Kafana Kod Juge you can count on great fun, excellent music whit best live bands that will play just for you. Tavern Kafana Kod Juge is planing to become absolute center of nigh life in Belgrade and it will become prestigous to be seen in tavern Kafana Kod Juge. This place will have all details appropriate to one tavern, beautiful interior, excellent music and low prices. True bohemian sanctuary. Tavern Kafana Kod Juge is one of those taverns that you will love at first sight with domestic atmosphere that is keeping up tavern life stable. 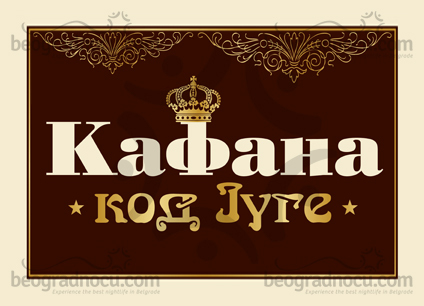 Tavern Kafana Kod Juge is flood of good entertainment that will always have good song and positive vibe for everyone. Staff of this tavern is very friendly and professional and always ready to serve you and to make your time spent here even better. Tavern Kafana Kod Juge is true bohemian life on river that will walk you through different tavern destinies and evoke beauty of tavern life - impossible not to love. You only have to let yourself to magic of tavern Kafana Kod Juge and your cheerful tavern destiny is ready to start.